Monster Aftershock Battle of the Bands Victory! We’re very proud to announce that Assuming We Survive has won the chance to play at Monster Energy Drink’s Aftershock Festival this coming weekend in Sacramento, CA on Saturday, August 15th!!! 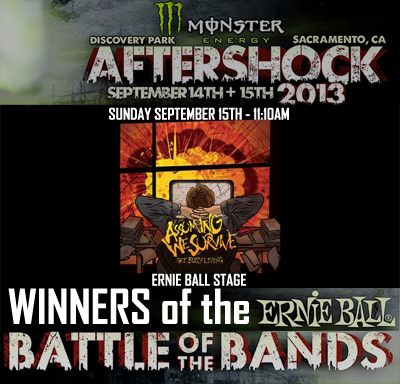 Thank you so much to all of our fans who have supported us and a huge thank you to Ernie Ball and Monster Energy!